Calculating the cost to shareholders of stock given to employees to drive behavior and align compensation. The majority of long-term incentives arrangements utilize shares of company stock as a mechanism for driving employee behavior and aligning compensation to shareholder value creation. The use of shares does not create a cash expense; however, it does have a cost to shareholders through dilution of earnings and voting power of existing shareholders. (See separate document for accounting treatment of long-term incentives.) Dilution, overhang and run rate are various methods for measuring this cost to shareholders. Applying this formula to the example above would result in 10 / (10 + 100) = 9.01%. This means that an existing shareholder’s earnings and voting power would be diluted by 9.01% if all 10 shares were issued. Most companies keep a close watch on dilution to ensure costs to shareholders are kept within acceptable limits. This is typically done through a comparison of dilution levels to a group of similarly sized peer companies within the same general industry. 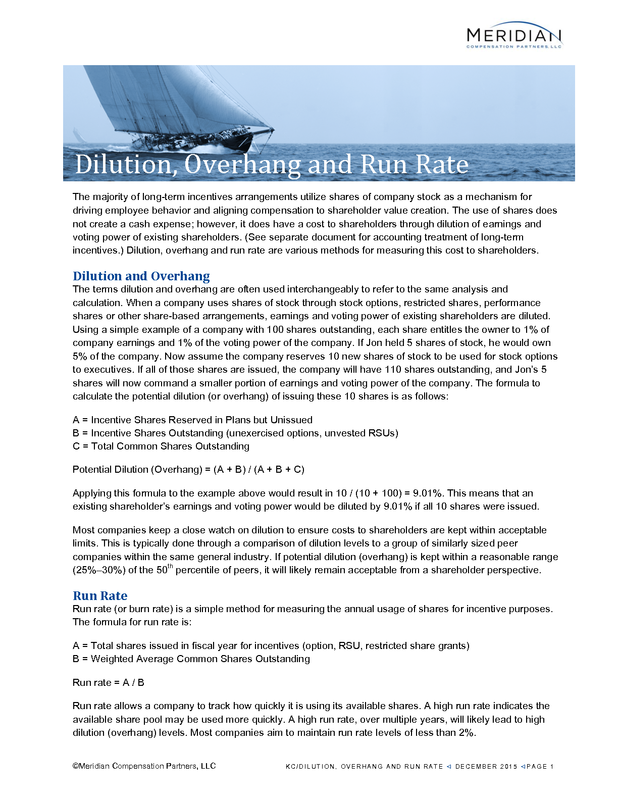 If potential dilution (overhang) is kept within a reasonable range (25%–30%) of the 50th percentile of peers, it will likely remain acceptable from a shareholder perspective. Run rate allows a company to track how quickly it is using its available shares. A high run rate indicates the available share pool may be used more quickly. A high run rate, over multiple years, will likely lead to high dilution (overhang) levels. Most companies aim to maintain run rate levels of less than 2%. ISS applies its own methodology when evaluating dilution and run rate. ISS applies this evaluation whenever a company seeks shareholder approval for a new authorization of shares under an incentive plan. The ISS dilution approach is referred to as their Shareholder Value Transfer (SVT) model and they refer to run rate as burn rate. The SVT model has some similarities to the simple dilution formula described earlier; however, the SVT model differentiates between vehicles such as stock options and restricted shares, placing a greater weight on full-value share awards such as restricted shares. The ISS burn rate formula is very similar to the run rate formula discussed earlier; however, ISS applies a factor to full-value awards giving them greater weight.